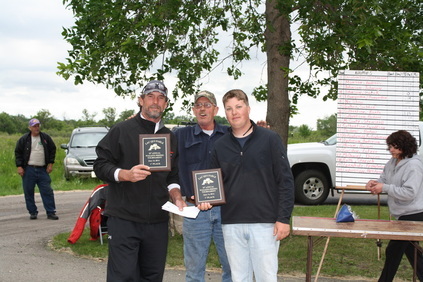 On Saturday, June 14th, the 35th Annual Lac Qui Parle Lake Association Walleye Tournament was held on Lac Qui Parle Lake. 58 teams competed for a top prize of $2200. Mother nature gave anglers overcast skies, 25-30 mph south winds and rain at take-off, but overall was better than expected. Due to high water conditions the majority of the boats were limited to fishing the Milan Bridge and South. Fish were caught all over the lake, but it seemed that pulling crank baits by the islands and near the rock piles on the south end of the lake, or using a jig and creek chub at the Milan bridge was the most effective. Many anglers reported catching good numbers of fish while pre-fishing in the 14-16" range and a few anlgers did catch good numbers of 20"+ walleyes too. Top honors went to Brian Greve of Marshall, MN and Taylor Greve of Sioux Falls, SD with a winning weight of 14.87 pounds. 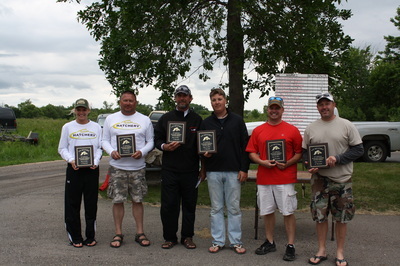 Team Greve also had the second largest walleye of the tournament weighing 7.47 pounds. In second place was Scott Kindvall and Jason Bierman of Sioux Falls, SD. They brought a basket to the scales that weighed 12.82 pounds. Third place went to Tom and Katarina Kuhlman from Boyd, MN. The father/daughter team weighed an 11.05 lb pound basket that included a 5.54 lb walleye. Bryce and Brittany Prellwitz of St. Cloud, MN earned fourth place with a weight of 10.44 pounds. Rick Hoium of Madison, MN and Bob Hoium of Montevideo, MN rounded out the top five with a weight of 10.02 pounds, including a 7.28 lb walleye. Big Fish of the tournament was a 7.58 lb walleye caught by Bob Henderson and Larry Anderson of Worthington, MN. A Big Thank You to tournament director Wayne Stensrud and his family, as well as Andy Johnson for all there work during the tournament. We would also like to thank all the participants of the tournament for your continued support.